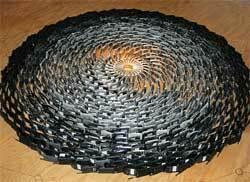 These are thousands of discarded cellular phones curved around one another in the spiral reminiscent of a flower. Boston-based artist Rob Pettit uses cellular phones to create sculptures. Pettit says for some sculptures he uses about 5,000 cellular phones. This is just a fraction of the number of cellular phones that go into landfill everyday. Uttar Pradesh will now add a regional tang to mid-day meals by introducing rajma, kheer and other local dishes. Sudan is exporting food received in charity, even as donor groups struggle to feed millions of starving Darfurians. The government says it is trying to build its economy. Zimbabweans are using petrol coupons as alternative currency following a drastic shortage of newly introduced bank notes. 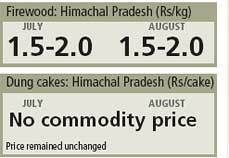 Its inflation was at 11.2 million per cent in June. Soaring prices of fertilizer and petrol made Zambia ask farmers to adopt conservation farming that involves growing nitrogen fixing crops. Rice production gets a boost as Thailand plans to lease 160,000 ha of unused state-owned land to poor farmers and agri-businesses. Global Environment Facility has set up a project worth US $26.45 million to protect pollinators like bees, bats and birds, essential for crops. Eating kangaroo meat instead of beef could cut Australia's GHG emissions by 3 per cent a year, says a study. Wildlife groups say five kangaroo species are on the brink of extinction. Japan will take legal action against three conservationists of Sea Shepherd who obstructed its whaling fleet last year. 2000 elephants have been killed in and around Hwange National Park in Zimbabwe where wildlife is being decimated because of its economic crisis, claim conservationists. Brazil created a fund to protect the Amazon forest by investing in sustainable industries like rubber and latex. A Bornean clouded leopard was photographed for the first time in Indonesia's Sebangau national park--a peat swamp forest that is at risk from logging and forest fires. Alaska's Bering Glacier is melting at double the rate than previously thought. It is releasing 30 km 3 of water a year. Endosulfan's use and transport has been prohibited in the Philippines' Bukidnon province. Prince Charles said increased use of GM will lead to environmental disaster. His remarkes were challenged by UK's environment minister. Brown bears have a supporter in French First Lady Carla Bruni who is all for their reintroduction in the Pyrenees. Green groups have urged 35 MNCs to assess the environmental fallout ahead of a rush to tap oil and gas deposits in the western Amazon forest. Peaches gone rancid are perfect for making ethanol, it has been found as they are packed with sugar. This makes them ideal to convert into hydrogen. Laos passed a law to fight bird flu. It will enforce a framework to regulate poultry industry and strengthen veterinary aid. It hasn't reported a single case. lvory Coast confirmed 19 yellow fever cases since May. WHO warns the country is at an 'elevated' risk of epidemic. South Africa recalled two types of Antiretroviral drugs manufactured by Adcock Ingram after it discovered a packaging error. 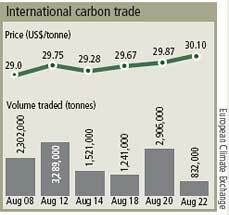 China raised export taxes on coking coal to 10 per cent and that on coke to 40 per cent, to check the energy crisis. Indigenous groups in Peru are protesting a law that easily allows national and international companies to purchase community land. International AIDS conference ended in Mexico with a warning that commitments made by G8 nations to fund access to HIV/AIDS treatment by 2010 may not be met. Carbon neutral by 2021. That is the tough target Costa Rica has set for itself, the only developing country to do so. To promote fruit and vegetable intake among people, UK's health department plans to fund shops in deprived areas for better sale. Google is investing US $10 million to generate power from underground heat with a novel technology, that is an improvement of the century-old technique of tapping energy from geysers or volcanoes. A protocol signed at the Southern African Development Community summit calls for 50 per cent representation by women at all levels of government by 2015 and laws that ensure gender sensitiveness. Iceland plans to offer 100 offshore licences for oil and gas exploration over 16,200 ha of Arctic waters, about 330 km north-east of the country. First licences will be valid for 16 yrs. 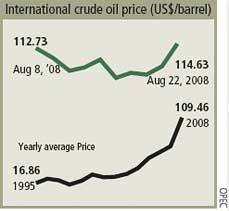 Shell's local operations have been bought by Bolivia in a bid to nationalize its energy sector. Ecuador's Galapagos Islands, a UNESCO world heritage site, were recently under a botanical alert after a destructive medite-rranean fruit fly was detected. 200 million people across the world risk their health daily by eating food grown using untreated wastewater, contaminated with heavy metals and raw sewage.